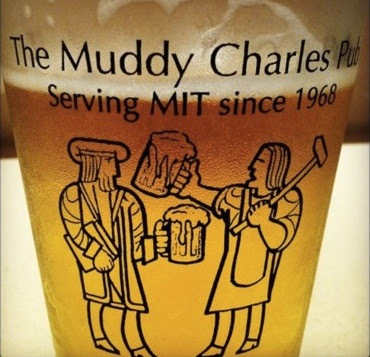 "On a campus dominated by cold concrete and hard science, the Muddy Charles pub exudes warmth [and] welcomes Nobel laureates and graduate students alike. 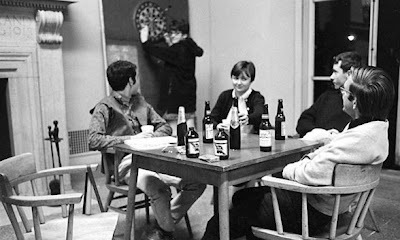 [...] Begun as a Friday afternoon club, the pub became an official MIT institution (and got its current name) when the Graduate Student Council began running it in 1968. Roughly equidistant from many major departments at MIT, the Muddy pulls together people from across campus [...] The combination of cheap drinks and big ideas draws a smart, eclectic crowd and prompted Media Lab lecturer Joost Bonsen '90, SM '06, to hold his informal venture capital meet-and-greets there. (Bonsen was among the "venture catalysts" in Venture Café, a book about high-tech entrepreneurs that puts the Muddy on its list of places where great ideas can meet great funding.) Bonsen points to MIT's Energy Club as an example of a big idea hatched at the pub. 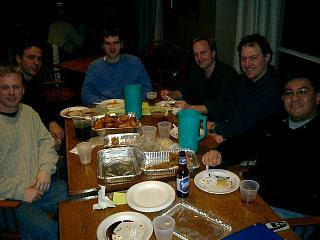 Now one of MIT's largest clubs, it was originally "a small group of students who gathered over beer at the Muddy once a week to talk about various energy topics" [Indeed, the pub is] "a crucial aspect of the MIT experience." As of November, [ill-considered] plans to renovate Walker [and kick out the pub] were still up in the air, leaving the Muddy's fate uncertain. Yet one thing is clear: athletes, teachers, and scholars all feel welcome there, and the people who find their way inside seem to end up with a lifelong affection for the place." It's a wonderful venue for ethanol-fueled ideation and creativity! Indeed, the Muddy is perhaps the single most important piece of extracurricular infrastructure at MIT and yet our current Institute senior administration is quite clueless about its legacy. Not only was the MIT Energy Club born there, but also the MIT Energy Conference, TechLink, TinyTech Club, Acoustic BBQ, i-Teams class, project collaboration, multiple startup companies, and more, nevermind all the Welcome-to-MIT initiations, PhD defense celebrations, alum reunions. We'll see if those currently in power figures out that Walker Memorial really ought to be a graduate student, post-doc, and alumni center or something actually useful. 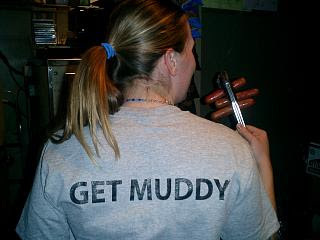 In any case -- for now -- the Muddy is still serving affordable joy by the pint & pitcher! "WindFlip barge concept was designed to simplify the installation of offshore wind turbines and in the process has managed to be a solution that also cuts cost. 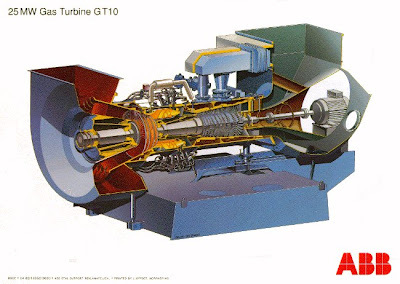 Installing offshore wind turbines can be an expensive task -- the process requires skilled technicians to assemble turbines at sea, and to anchor them at great depths. 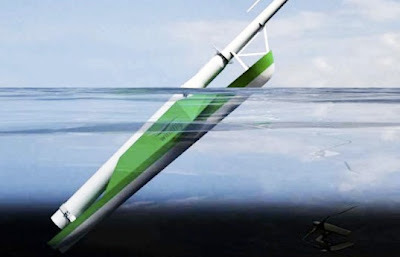 Alternatively, the WindFlip barge allows turbines to be assembled completely on shore, towed to their location, and then simply tipped into place -- thus minimizing the need for expensive work at sea." 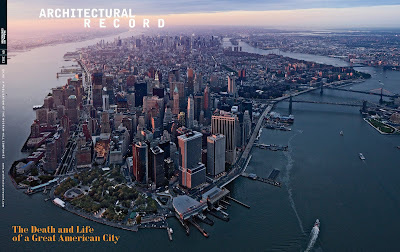 "...about the projects and people in cities across the world who believe that, even as we become more urbanized, we must reclaim an essential piece of our humanness -- our connection to the nature around us. Amazing projects in cities around the globe have already begun this task. 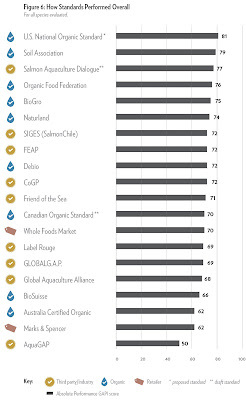 It is our goal to raise the consciousness and understanding of this movement as we explore the need of moving not only to sustainability, but also to a regenerative way of living." 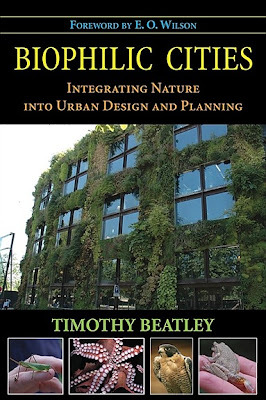 Also related new book by Prof Timothy Beatley on Biophilic Cities. 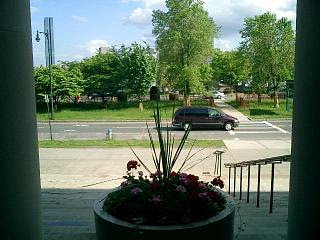 Thanks to Landscape+Urbanism for spotting these! As part of our MIT Living Labs & Urban Ventures classes this past Fall 2011, we had a fascinating tour of MIT's Cogen facility, a so-called District Heating system paired with a cogeneration electricity generating gas turbine... ...which distributes the resulting heat via both steam and now hot water pipes throughout campus. By using absorption refrigerators, chilled water is also supplied. 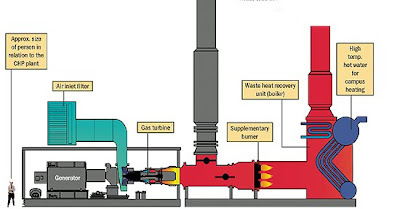 This combined cooling, heat, and power system -- more accurately trigeneration -- is remarkably thermally and economically efficient. 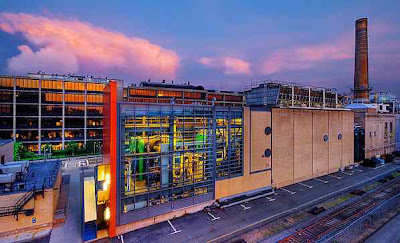 Such cogen and trigen systems are already widespread -- for example, New York and many cities in Sweden, Russia, Finland, and other campuses besides MIT -- and together with water supply, sewage systems, infrastructural tunneling and connections, and pipe-based solid waste handling systems are fantastically interesting and relevant District Solutions for our vital cities. 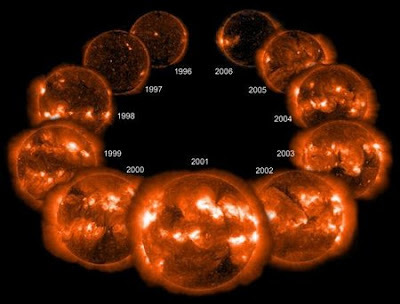 "Solar and Heliospheric Observatory (SOHO) spacecraft compare sunspots on the Sun’s surface (top row) and ultraviolet light radiating from the solar atmosphere (bottom row) at the last solar maximum (2000, left column) and at the current solar minimum (2009, right column.) 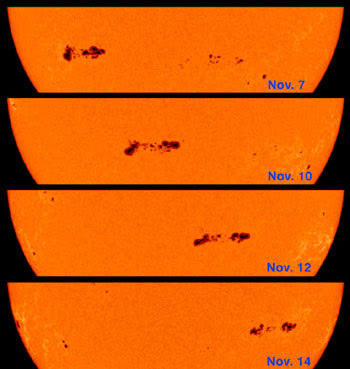 The sunspot images were captured by the Michelson Doppler Imager (MDI) using filtered visible light. 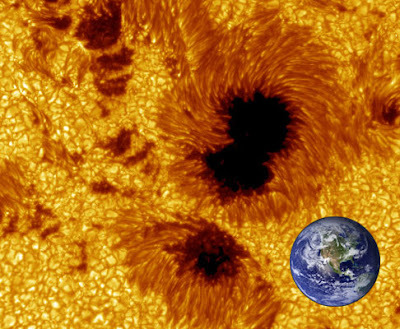 On March 18, 2009, the face of the Sun was spotless..."
"The other set of images, acquired by the Extreme Ultraviolet Imaging Telescope (EIT), shows ultraviolet light radiating from the layer of the atmosphere just above the Sun’s surface. 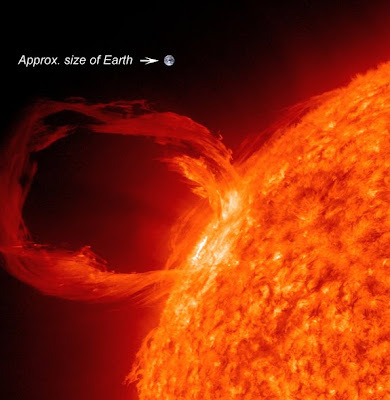 This part of the solar atmosphere is about 60,000 Kelvin -- a thousand times hotter than the surface of the Sun itself. 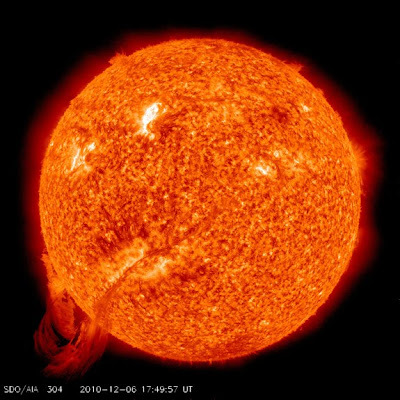 On July 19, 2000, the solar atmosphere was pulsating with activity: in addition to several extremely bright (hot) spots around the mid-latitudes, there were also numerous prominences around the edge of the disk. On March 18, 2009, however, our star was relatively subdued..."
"Galileo was the first to discover how fast the Sun spins by studying the movement of sunspots. The Sun spins? You bet! Even more amazing, some parts of the Sun spin faster than others." 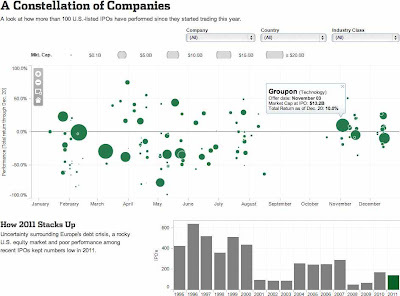 Here's observed spots graphed over the longterm... Another way of visualizing patterns is via this Butterfly Diagram... Finally, movies via the Helioviewer! 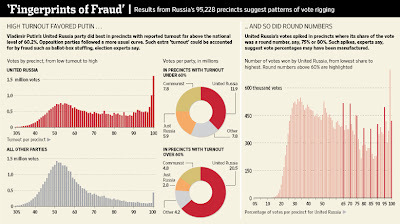 "A comprehensive examination of the full results from Russia's nearly 100,000 voting precincts reveals statistical anomalies that experts say are consistent with widespread vote-rigging. These irregularities could cast doubt, by one rough measure, over as many as 14 million of the 65.7 million votes reportedly cast. [...] statistical analysis revealed phenomena that scholars who study vote data say are suggestive of vote-rigging.‬ "These are sometimes called the fingerprints of fraud," said Alberto Simpser, professor of political science at the University of Chicago. "If they all point in the same direction," he said, referring to statistical as well as observer and other evidence, "that's a very strong case. "‬ The results are studded with groups of precincts that report exact round numbers for voter participation -- say, a turnout of 70%, 75% or 80%, up to 100%. Several groups of precincts also report similarly high round numbers of voters for United Russia. Such round figures occur significantly more frequently than nearby figures -- a phenomenon statisticians say is highly unlikely to come from a random distribution of numbers.‬"
Geek spots MorpHex, a hexapod robot by Norwegian Kare Halvorsen that transforms from sphere into perambulator! 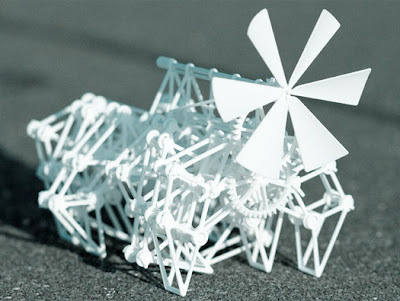 Amy in .nl spots Dutch artist Theo Jansen's 3D printed Strandbeest with propeller propulsion and this nice write-up on Mocoloco. Further description at Shapeways. In a just world, those directly and indirectly responsible would all be held criminally culpable for this death -- and for the many other related and entirely avoidable safety incidents between motor vehicles and the bicyclists and pedestrians they threaten daily. 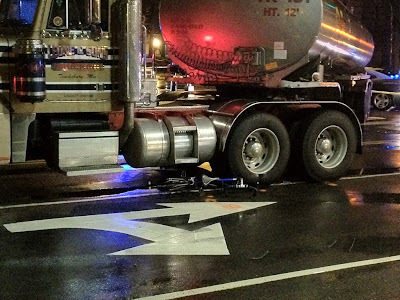 Let's look at the evidence: the photos show the murder victim's bike is crushed under the wheels of the JP Noonan-owned truck which is completely on the wrong side of the road. 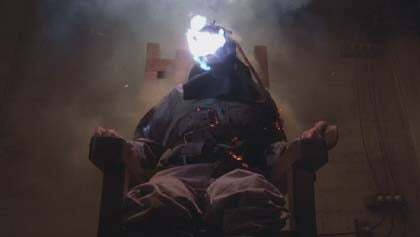 That driver should get the electric chair and yet the latest press reports indicate he's not even being charged. 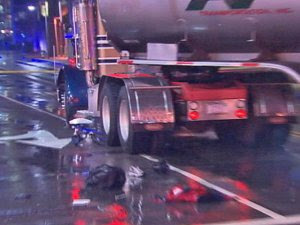 Even worse, an MIT campus policeman told me yesterday -- with a completely straight face, mind you -- that the word is "the bicyclist just ran into the truck" and that's why he died. So this vicious murder by means of criminally negligent and reckless driving is actually either an unfortunate "accident" or it's really the victim's own fault. Are you F#CKing kidding me?! This is completely appalling. 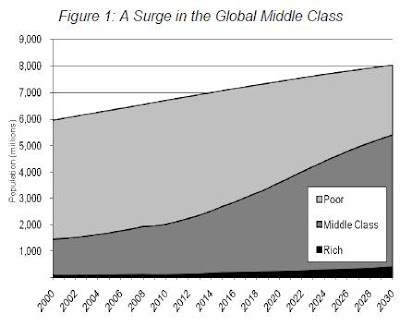 "Average incomes in developing economies are growing more quickly than at any previous time in history according to a recent report by the McKinsey Global Institute. 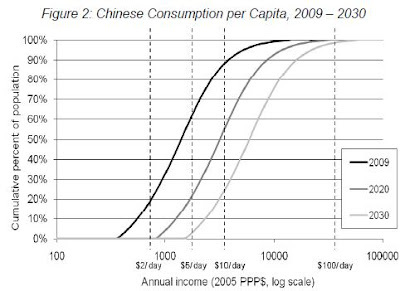 It took more than 150 years from the start of Britain's industrial revolution for GDP per person (measured at purchasing-power parity) to double from $1,300 to $2,600. [...] China did it in just twelve." "...were inaugurated Tuesday by Medellín Mayor Alonso Salazar and the Urban Development Company, or EDU, that tackled the joint initiative four years ago. 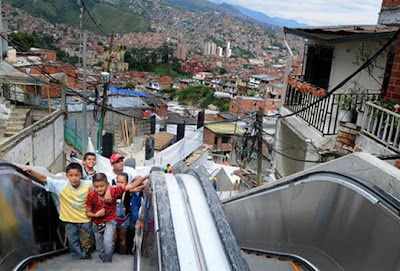 [...] The project, with a cost of 10 billion pesos (about $5.2 million), involved the Japanese company Fujitec, which designed the escalators and manufactured them at its plant in China, along with Conservicios, a local firm responsible for importing and installing the parts. [...] It’s a “transit solution that will give residents a better quality of life,” Campuzano said. EDU is a decentralized industrial and commercial organization of the municipality of Medellín, the provincial capital of Antioquia and the second most important city in Colombia. 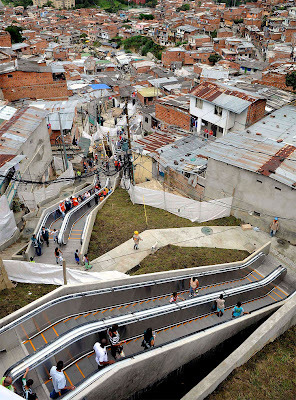 The escalators are not the first in the world to be installed outdoors, since there are several for purposes of tourism, but this is a first for urban transport. [...] The work as a whole includes 1,102 sq. meters (11,846 sq. feet) of public spaces, 343 meters (1,125 feet) of pedestrian walks, two public buildings -- one of them with a terrace overlooking the city -- plus benches and other urban furnishings." "More than six miles long, it transforms a formerly neglected area in the middle of Spain’s capital. 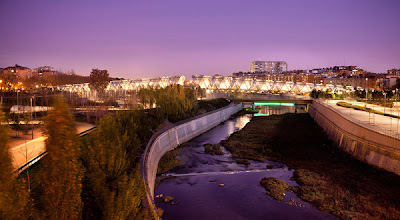 Its creation, in four years, atop a complex network of tunnels dug to bury an intrusive highway, also rejuvenates a long-lost stretch of the Manzanares River, and in so doing knits together neighborhoods that the highway had cut off from the city center. All around the world, highways are being torn down and waterfronts reclaimed; decades of thinking about cars and cities reversed; new public spaces created. [...] But Madrid Río is a project whose audacity and scale, following the urban renewal successes of Barcelona, Spain’s civic trendsetter, can bring to a New Yorker’s mind the legacy of the street-grid plan, which this year celebrates its 200th anniversary. That’s because the park belongs to a larger transformation that includes the construction of dozens of new metro and light-rail stations that link far-flung, disconnected and often poor districts on Madrid’s outskirts to downtown." 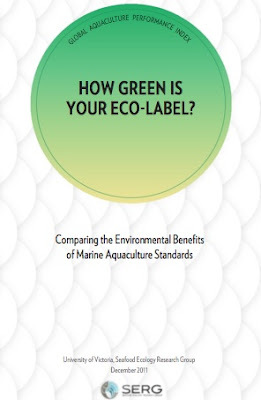 Thanks to Pew Environment for New Study Puts Eco-labels to the Test about the University of Victoria's How Green is Your Eco-label? 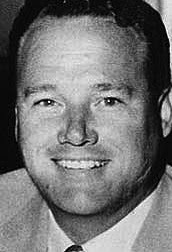 Tantlinger passed away this summer at age 92 having been able to witness a half-century of containerization progress and realize that his key inventions are used in hundreds of millions of container transhipments per year and some 90% of non-bulk cargoes! Epic! "...now employs 250 people in his fast-growing catering empire. 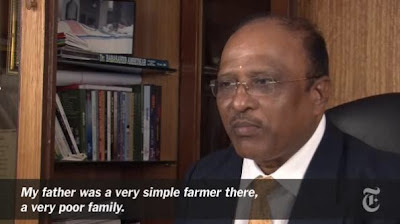 Born to a family with next to nothing, Sarath dreams of an India without hunger. He has set himself the target of providing for half a million people, by creating 100,000 (known as one lakh) jobs. "I give a job, and that person takes care of four to five people -- so I take care of five lakh people directly," he says. 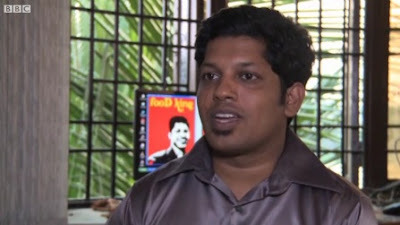 [...] Sarath launched Foodking in 2006, supplying snacks to banks, software firms and other corporates, with just 2,000 rupees (£24; $38) to fund the first month. But with his impressive academic pedigree, he was soon able to secure a bank loan of 100,000 rupees (£1,205; $1,890), and employed eight to 10 workers. The expansion continued, and he now has seven outlets and an annual turnover of $1.3m. [...] Sarath's drive remains strong. He wants to have 100 outlets by the end of this year -- and 5,000 across the state eventually. [...] He already gives lectures at schools and business institutes, and spends time encouraging children in a local slum to continue studying. And he hopes to inspire 1,000 entrepreneurs across the state, who too would go on to create employment opportunities for others." 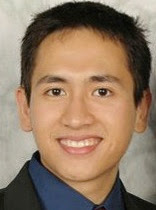 "From late March 2006 through the early August 2009, nearly 3.5 million people signed up for twitter. 2.3 million of those users signed up in the 408 cities displayed here. As users sign up, the blue circles grow and size and turn read then that city reaches a critical mass of users. We defined critical mass as achieving 13.5% of the total number of users that city will gain over the three years. The graph represents the number of new users signing up each week." 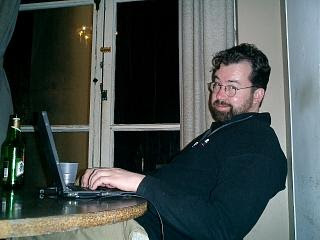 "...the site’s growth in the United States actually relied primarily on media attention and traditional social networks based on geographic proximity and socioeconomic similarity"
"As an alternative to celebrating the religious holiday Christmas, some atheists, skeptics, and other non-believers have chosen to celebrate December 25th -- the birthday Newton shares with Jesus Christ -- as Newtonmas. Celebrants send cards with "Reasons Greetings!" printed inside, and exchange boxes of apples and science-related items as gifts. The celebration may have had its origin in a meeting of the Newton Association at Christmas 1890 to talk, distribute gifts, and share laughter and good cheer. 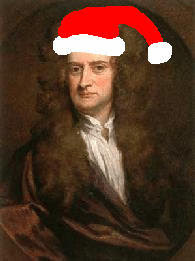 The name Newtonmas can be attributed to the Skeptics Society, which needed an alternative name for its Christmas party. [Of course] Newton's birthday was December 25th under the Old Style Julian Calendar used in Protestant England at the time, but was January 4th under the New Style Gregorian Calendar used simultaneously in Catholic Europe. The period between has been proposed for a holiday season called "10 Days of Newton" to commemorate this." "...the camera tracks an act of kindness as its passed from one individual to the next and manages to boomerang back to the person who set it into motion"
"...minerals are powering Australia's economy to record highs. And as demand from China for more resources grows, new mines continue to open across the country. But critics say there is a dark side to this success story. Mining regions attract transient workers [FIFO's] keen to make a quick buck, creating social and environmental problems and a rising crime rate. Mines are also draining Australia's pool of skilled labour from other industries and driving up wages. 101 East asks: What is the cost of Australia's mining boom?" Thanks to Jarrett Goetz for spotting Delta's Behind-The-Scenes: Your Bag's Journey "after they pass through those black rubber flaps at the airport." Thanks to International Liberty's Dan Mitchell for spotting the In-Your-Face Smackdown of Europe’s Bureaucratic Empire by Ryan Air's Michael O'Leary. Brilliant evisceration of unmitigated bloatocracy! "There are just over 526,000,000 Christian kids under the age of 14 in the world who celebrate Christmas on December 25th. 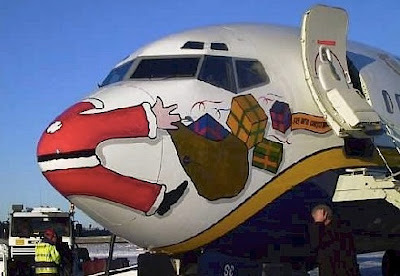 In other words, Santa has to deliver presents to almost 22 million kids/hour, every hour, on the night before Christmas. 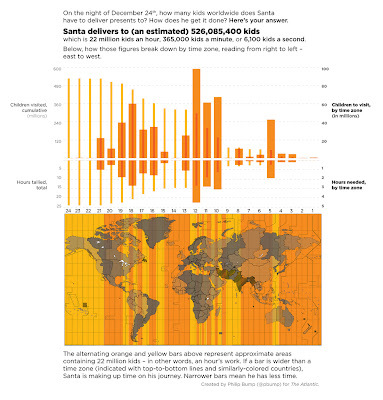 That's about 365,000 kids/minute; about 6,100/second. Totally doable." Thanks to Freakonomics for spotlighting this! "If I had the power to produce exactly what I want for next Christmas, I would have all the kings and emperors resign and allow the people to govern themselves [...] I would have all the cardinals, archbishops, bishops, priests and clergymen admit that they know nothing about theology, nothing about hell or heaven, nothing about the destiny of the human race, nothing about devils or ghosts, gods or angels. I would have them tell all their “flocks” to think for themselves [...] I would like to see all the politicians changed to statesmen -- to men who long to make their country great and free -- to men who care more for public good than private gain -- men who long to be of use. I would like to see all the editors of papers and magazines agree to print the truth and nothing but the truth, to avoid all slander and misrepresentation, and to let the private affairs of the people alone. [...] I would like to see the millionaires unite and form a trust for the public good. I would like to see a fair division of profits between capital and labor, so that the toiler could save enough to mingle a little June with the December of his life [...] I would like to see the whole world free -- free from injustice -- free from superstition. This will do for next Christmas. The following Christmas, I may want more."